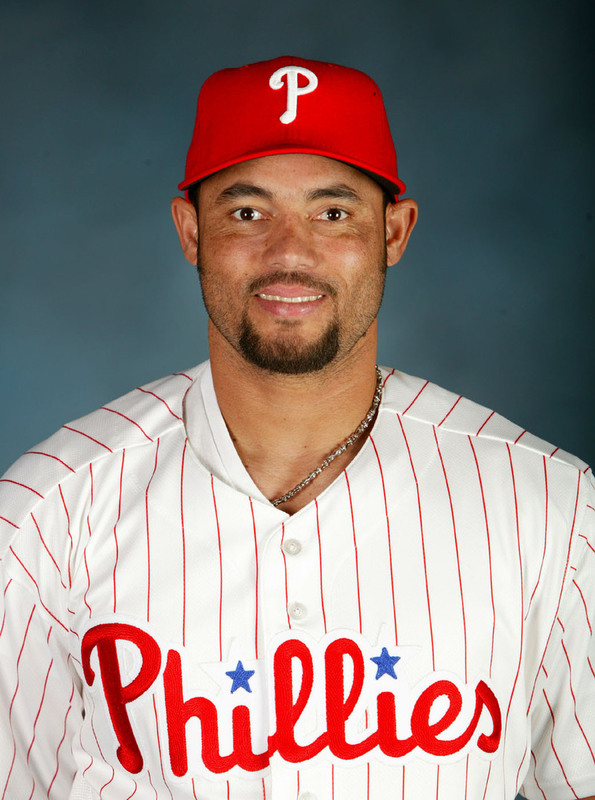 Well, it is official, Pedro Feliz is our new third baseman. He was on our radar a few years ago when Scott Rolen wanted to be traded but the Giants wouldn’t part with Pedro as part of a deal. Pedro passed a physical exam this morning and now the Phillies have one of the best infields in baseball. Talk about the long ball, how about 119 from the foursome of Howard-Utley-Rollins-Feliz. He also brings the best fielding percentage among last year’s NL third basemen, .973. He made just 11 errors. Defense is one of our strong points and that phase of the game has gotten better. Good defense can be a huge boost for a pitching staff. A right-handed hitter who has 100 homers over the last five seasons, Pedro helps balance the attack. Howard, Utley and Jenkins provide power from the left side; Burrell, Feliz, Werth and Ruiz from the right side with Rollins and Victorino being switch hitters. Another plus: the Phillies bench just got stronger and deeper. Dobbs and Helms will have new roles. The bench reminds me of the 1977 Phillies when Danny Ozark could call on right-handed hitters in Davey Johnson, Ollie Brown and Jerry Martin and left-handed hitters in Tommy Hutton and Jay Johnstone. As Rich Hofmann pointed out in his Daily News column yesterday, Feliz’ arrival means Charlie Manuel won’t have to use two players per game at third base, leaving him with more late-game options. People were concerned that the Phillies lost a lot of offense when Aaron Rowand (27 HR, 89 RB) signed with the Giants. Say hello to 41 HR and 136 RBI by the Feliz/Jenkins combo. Speaking of Feliz and Jenkins, each free agent has signed a two-year contract, meaning both will be around in 2009, giving the Phillies a lot of stability. The team that led the NL in runs scored just got stronger. A year ago Jimmy Rollins put a bull’s eye on his uniform when he said the Phillies were the team to beat in the NL East. It certainly got the attention of the New York media and fans. In the end, Rollins’ prediction came true. 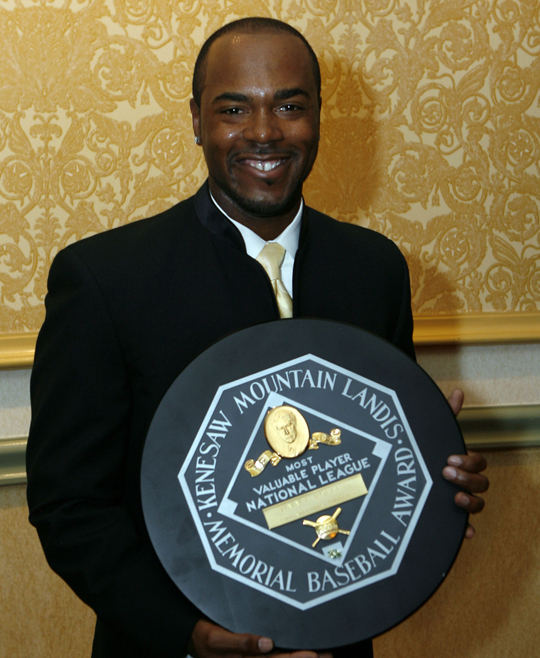 On Sunday night, Jimmy received his 2007 NL MVP Award at the New York Baseball Writers Association of America banquet, a major black tie event. It was a pretty powerful baseball banquet with all the national award winners, new Hall of Famers Goose Gossage and **** Williams, Luis Tiant, Denny McLain, Yogi Berra, Bobby Murcer, Brian Cashman, Omar Minaya, Joe Girardi, Willie Randolph and Zoba Chamberlain. There were no jeers for Jimmy on Sunday night, just cheers. When it came time for Jimmy to receive his award the presenter was none other than Alex Rodriquez, the AL MVP winner. A-Rod was styling, the only person dressed in a black velvet tux. Jimmy also thanked A-Rod, his dad (“for taking line drives off his arms during back-yard hitting”) and his mom (“for teaching me to talk trash”). That last comment drew a huge J-Roll smile and laughter from the 1,000-plus audience. Hopefully, next year we can make our fifth appearance at the New York banquet this decade (Larry Bowa, 2001 NL Manger of the Year), Ryan Howard (2005 Rookie of the Year, 2006 NL MVP) and J-Roll. Might was well stay on a roll. There’s a lot of buzz about Ryan Howard’s contract situation. Newspaper stories, talk radio topics and message board fodder. As has been published, Ryan’s side has submitted a $10 million figure, the Phillies are at $7 million, which matches the largest contract ever for a player in his first year of arbitration. Howard is eligible for arbitration for the first time as a “super-two” player. Generally, a player needs three years of service time in the majors to be eligible. Ryan has two years and 145 days which makes him eligible under the “super two” rule in which he ranks in the top 17 percent of players with more than two but fewer than three years of service. (182 days constitute a baseball season and determine service time). Service time is part of the baseball process that was negotiated by baseball and the players’ union a long time ago. So, arbitration is part of this process. Players with six years of major league service then are eligible for free agency. Ryan will be eligible after the 2011 season. That also means he will be eligible for arbitration in 2009, 2010 and 2011. By being a “super-two” player, he has four years of arbitration as opposed to three, which is the norm. Once figures are exchanged, the sides can continue to negotiate up until they walk in the door of an arbitration hearing which involves both sides and a three-person panel. In addition, some multi-year deals have been completed following arbitration decisions. Hearings this year will be scheduled in St. Petersburg, FL, between February 1 and 21 (Ryan’s been set for the 20th). The arbitrators will listen to each side and make a decision. There is no middle ground. Bottom line: at some point the contract will be settled and the Phillies look forward to having Ryan in the middle of the lineup for 162 games and many more years. 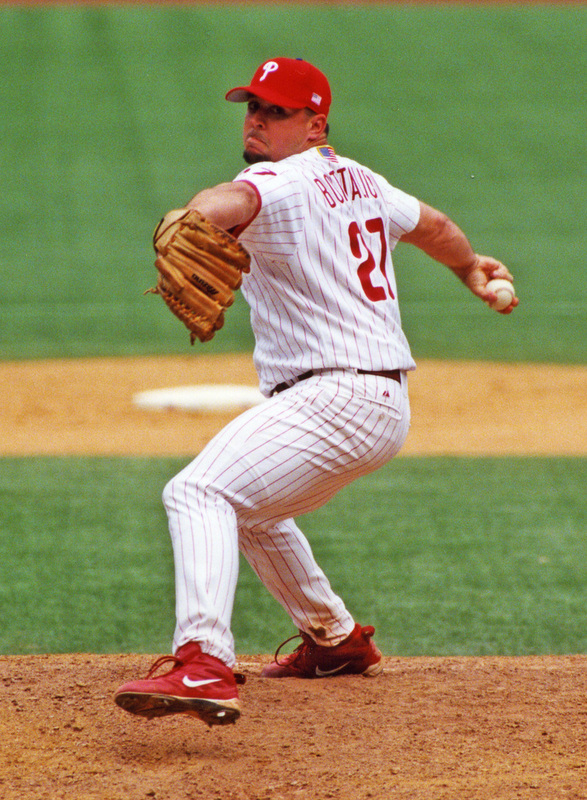 Every now and then, Phillies Alumni will be featured in Phillies Insider. Just an effort to keep fans up to date on the former Phillies players. The annual Phillies Phantasy Camp takes place next week in Clearwater, FL. The camp closes with a series of games at Bright House Networks Field on Sunday, January 27. There is no admission charge for Sunday’s games. Dickie Noles (1979-80; 90), Mickey Morandini (1990-97; 2000), Marty Bystrom (1980-84), Von Hayes (1983-91), Kevin Jordan (1995-2001), Jim Eisenreich (1993-96), Kevin Stocker (1993-97), Milt Thompson (1986-88; 93-94), Ricky Bottalico (1994-98; 2001-02) (photo), Tyler Green (1993; 95-98), Tommy Greene (1990-95), Mitch Williams (1991-93), Kevin Saucier (1978-80), Juan Samuel (1983-89), Ricky Jordan (1988-94), John Denny (1982-85), Warren Brusstar (1977-82), Greg Luzinski (1970-80), Terry Harmon (1967; 69-77) and Larry Andersen (1983-86; 93-94). Video reports from the camp will be posted on this site with Scott Palmer as the host. Speaking of Ricky Bo, he’s embarking upon a new career as an analyst for the Lehigh Valley IronPigs telecasts., starting in April. He’ll be in the booth for all of their home 72 home games. Mitch returns as a baseball analyst for Comcast SportsNet. Greg Gross (1979-88) will coach with Lehigh Valley and Kevin Jordan at Clearwater. Former outfielder Eric Valent (2001-2002) returns to the organization as a coach with the Williamsport Crosscutters. Randy Ready (1989-91; 94-95) is San Diego’s AAA manager. Garry Maddox’s (1975-86) annual charity bowling tournament will be held next Tuesday. **** Allen, Milt, Mitch and Von Hayes are among the Alumni who participate in the fun event. Maddox has been hosting this event since the late 1970s. Von Hayes, who had managed in the minors for a while with the Diamondbacks and A’s, will be the manager of the Lancaster (PA) Barnstormers in the Atlantic League. His pitching coach will be Rick Wise (1964; 66-71). Frank Lucchesi (1970-72), who managed the Phillies in their last game at Connie Mack Stadium and their first game at Veterans Stadium, is recuperating at his Texas home following by-pass surgery on his heart last month. 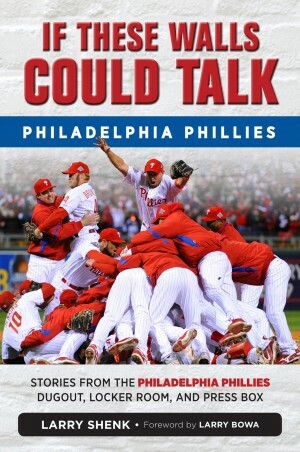 If anyone wants to send a card to Frank, please send it to my attention at Citizens Bank Park, Philadelphia, PA 19148. We will forward any and all cards to Frank. Sadly, three Alumni passed away this week, former pitching coach Johnny Podres (1991-96), RHP Don Cardwell (1957-60) and RHP Steve Ridzik (1950; 52-55; 66). “Pods”, 75, was a highly-respected and loved pitching coach. Cardwell, 72, was originally signed by the Phils and traded to the Cubs in 1960 in a deal that brought Tony Taylor to Philadelphia. Steve, 78, spent 12 seasons in the majors. Late last month, Dayn Perry, an author and one of the talented baseball contributors on FOXSPORTS.COM, wrote a story about the top ten 1-2 pitching punches in the majors for 2008 in his crystal ball. Very interesting list. Probably open for debate but that’s OK. There’s been a lot written that the American League is superior to the NL. Well, on this list, six of the 10 are from the NL. There’s little doubt that strong starting pitching is a key for any team seeking to be a World Champion. Pitching, these days, is such a scarce commodity. The Phillies leading winners a year ago were Hamels (15-5) and Jamie Moyer (14-12). Double figure wins came from rookie Kyle Kendrick (10-4) and Adam Eaton (10-10). A lot of people are down on Eaton but on July 20, he was 9-6. After that it was downhill, with a shoulder ailment part of the reason (DL in mid- to late August). As Phillies fans know, adding pitching was a priority this winter and the organization’s major move in this area was to trade for a closer (Brad Lidge) and move Myers back into the rotation. Simply put, there was no free agent pitcher on the market as good as Myers. Not to be overlooked was the re-signing of lefty J. C. Romero, a vital bullpen piece. Without J. C. we wouldn’t have won the NL East last year. Myers’ career record as a starter is 54-42; Hamels, 24-13. Both are on the young side, Myers, 27; Hamels, three years younger. They can be good and for a long time, barring injuries. 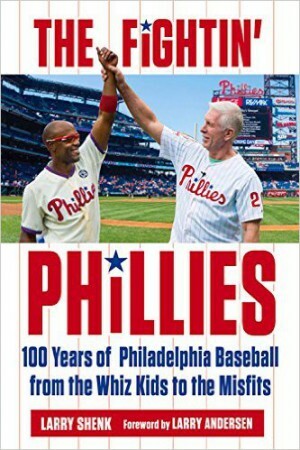 Who was the best 1-2 punch in Phillies history? What are your thoughts? Before signing off today, please be aware three online chats on this site are scheduled over the next week: Ruben Amaro Jr., tomorrow (1/11), 3:00 p.m.; Pat Burrell, Wednesday, 5:15 p.m. and Chase Utley, Thursday, 3:30 p.m. More chats will follow. Stay tuned. Don’t know how many Phillies fans watched the Redskins-Seahawks game last Saturday. I didn’t but did see a video clip of Jamie Moyer riling up the fans before the game. Moyer and his family live in Seattle, are huge Seahawks fans and season ticket holders. Someone in the family is always at a home game. One of the traditions in Seattle is the 12th Man. On Saturday, Moyer was selected for that honor. The Seahawks provided a suite for Moyer and his family; he did a radio talk show interview pre-game and then he and his family were taken to the field for a close-up view of the warm up session. 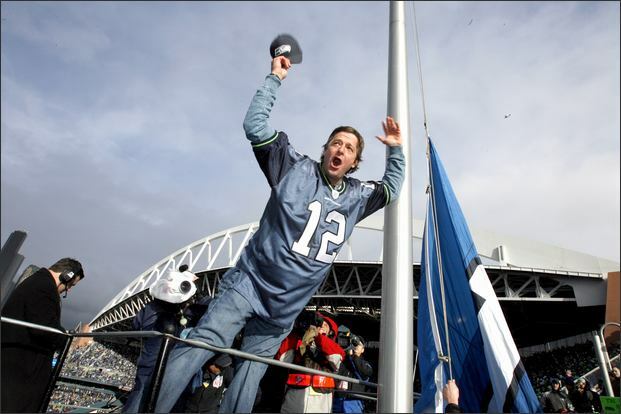 But, the part of the honor that was the attention-grabber: Moyer was the one to raise the 12th man flag…..from the south side roof of Qwest Field, yes a roof top level platform (and railing). Being a pitcher, Moyer should get the win since the Seahawks won. An encore has to be in the works. “No, it is a once-in-a–lifetime deal. Once and done. I’ll always remember it,” said Moyer with a great deal of enthusiasm. He sounded more like a 15-year-old. It’s that time of the year when December’s holiday bells are being replaced by January bills. It’s also the time of the year when football games dwindle to a precious few. No more yellow penalty flags or red flag reviews! It’s also the time of the year for the wheels of baseball to begin turning. The Baseball Writers’ Association of America will release the results of its Hall of Fame voting for 2008 at 2 p.m. on Tuesday. Twenty-five former major leaguers are being considered for election. Later this month, the Phillies will embark on their 39th consecutive Winter Tour which was originally known as a Press Caravan. We’ll have more details on this site early next week. Starting January 23, the popular Phillies Phantasy Camp will take place in Clearwater. The camp is sold out with 140 participants. A total of 20 Alumni will be part of the program. Baseball’s calendar this month also includes the arbitration process. Between the 5th and 15th, players may submit to arbitration. The Phillies have five players eligible for arbitration: Eric Bruntlett, Ryan Howard, Brad Lidge, Ryan Madson and Jayson Werth. On January 18, Major League Baseball and the Player’s Association exchange arbitration filing figures. Arbitration hearings are scheduled between February 1 and 20. At a hearing, each side presents its case and an arbitrator eventually makes the final decision, one figure or another. The arbitrator cannot choose a middle ground. During the entire process negotiations for a one-year contract or multi-year deal can continue between clubs and players. Settlement can take place up until the start of a hearing. More important on the February baseball calendar than arbitration hearings is the fact that spring training starts! The big date is February 7 when the equipment truck leaves Citizens Bank Park for Clearwater’s Bright House Networks Field. Pitchers and catchers work out for the first time seven days later on Valentine’s Day. Instead of flowers or candy for your spouse, a trip to Clearwater would be more dynamic. Go for it!